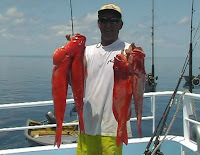 Just a little note on our annual fishing trip to the Swains Reefs in the Great Barrier Reef. After travelling to the Port of Gladstone in Central Queensland, from the Sunshine Coast, We headed to sea on board the MV. Booby Bird, around 3pm Saturday afternoon the 1st of November. Our destination is a group of reefs on the outer edge of the GBR, 135 Nm. North-east of Gladstone, 21deg. 52’28,S. 152deg. 27’37.E. about 16 to 18 hours of over night steaming. 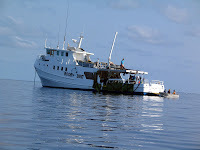 On clearing the harbour heads and turning north-east, into the open waters of the SW Coral Sea, we knew that we were going to have a comfortable trip. The wind was about 5-8 knots of afternoon sea breeze and the ocean had around 2 foot of wind slop on it. The forecast for the following week was for more of the same. The prediction of perfect weather, for the week, came true. We had 15 knots one night and that dropped out from daylight on. That was our “Bad Weather” for the week. Daylight saw us entering the Swain Reefs and we keep travelling till around 9am. The skipper, Captain Dean Grose , decided that we should try a bit of deep water drift fishing, with the wind and swell being all most non-existent, the conditions were in our favour. We were hoping to find ourselves being stretched and getting braid burns of the thumb by a few big Red Emperor, Lutjanus Sebae or Coral Trout, Plectropomus Leopardus. There is usually a bit of a competition between some of us, (Yeh, the ego’s don’t fade with age.) 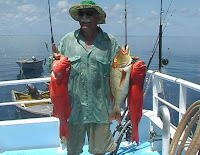 as to who lands the first and biggest Coral Trout for the trip. Mate, we had a ball. The big Reds were there, but the fish were too good for some of the boys. They found out all about their fishing gear in that first hour or two. The knots were not up to standard, that fishing reel, on special, was a heap of junk, it died on the first fish, and the excuses kept coming thick and fast. Some of the blokes hadn’t had a line in the water for many months and it takes a day or more to get tuned into the fishing on the Great Barrier Reef. On the trip out I handed out a few Pre-Venters, to the Skipper and Deckhands, and to the other fellows on the trip. ( A Pre-venter is a tool that safely deflates the inflated abdominal cavity, swim bladder, of reef fish. The Pre-Vent Tools were sent to me from Jeff Strane from Team Marine in Tampa, Florida USA. We went through the instructions and spoke about the benefits of venting fish prior to releasing the ones we did not want to add to the freezer. Some of us have been tagging and releasing fish for the last 20 odd years and can see the beliefs and theories to venting fish prior to releasing them. 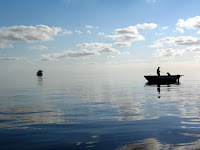 We have a boat policy on our trips that if you have to measure a fish, to see if it is of legal size, then it goes back. 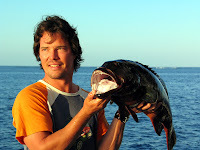 I like to see fish at least 50mm, longer than the minimum and I also like to release the larger of the species… These are the breeders, the future to our fishing enjoyment. One of our deckies …“It would be good to see all fishoes getting into venting, should be one in every tackle box.” All of the crew agreed that Venting will be part of the routine on future trips before releasing the undersized or not wanted fish. The charter boat crews and operators have a very good understanding of the need to protect and help in the sustainability of fish stocks on the GBR. Out of the 3 models we used, no body had a preference as to which one that they wanted to use.My fishing mate, Bryan, and I did a few tests with a couple of the smaller Sweet-lip and other Reefies, that we caught at the same time. We vented only one, and then, let them both go together. The vented one was well on it’s way back to the reef, about 20 metres down, and it’s mate was still in mid water. With the visibility of the water, it was easy to watch the larger fish, we released, all the way to the bottom.